South Korea and the United States will hold their annual defense ministers' talks in Washington, DC,next week to discuss the fate of this year's combined air exercise, the transfer of wartime operational control and other issues, Seoul officials said Friday. Defense Minister Jeong Kyeong-doo and his US counterpart, James Mattis, will attend the 50th Security Consultative Meeting on Wednesday amid the allies' efforts to ensure cooperation over denuclearization and a lasting peace regime on the peninsula. 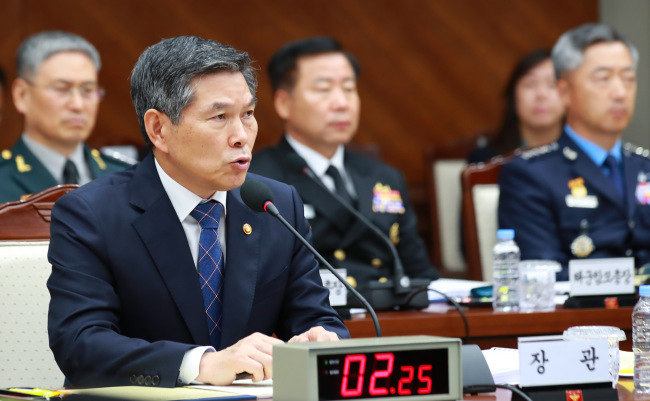 At the SCM, the two sides are expected to reach an agreement on the suspension of their annual massive Vigilant Ace air exercise that involved some 270 aircraft last year in a show of force against a then-provocative Pyongyang. Last week, the US Department of Defense said that the allies agreed to suspend the exercise. But Seoul's defense ministry said the allies just weighed "various ideas, including the suspension" in an apparent indication of differences over the fate of this year's exercise. Meanwhile, the defense ministry and the US Defense Department released a joint statement celebrating the 50th anniversary of the creation of the SCM. "Over the past 50 years, the SCM has played a central role in maintaining peace and stability on the Korean Peninsula while reinforcing the ironclad ROK-US Alliance," the statement reads in English. The statement also noted that the SCM and the alliance are taking on a greater importance than before as the security situations on the peninsula, the Asia-Pacific region and the world face a "turning point."